Orion, also known as 'The Hunter' is one of the most striking and recognizable of the all the constellations in the night sky. 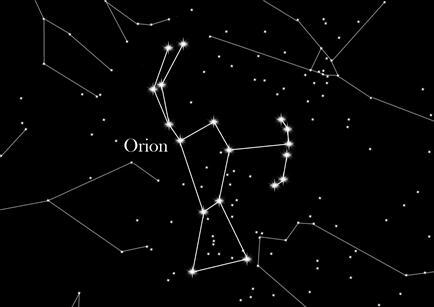 One of the oldest constellations, located on the celestial equator, Orion is well known for its giant nebula, or star forming region. The character of Orion is that of a fierce hunter, carrying a sword, who is fighting off the attack of a bull with a swing of his club. Orion is located almost directly on the celestial equator, forming an imaginary extension of the equatorial plane. The constellation's main feature is its 'belt' of three stars, sometimes referred to as the 'Three Kings'. These stars, called Alnitak, Alnilam and Mintaka, are also occasionally referred to as 'Jacob's Ladder' or the cross staff. This 'belt' is most easily visible in the northern hemisphere during the month of January. Finding the three stars of the belt is the simplest way of locating the constellation in the sky. Orion's armpit and left foot are marked by two of the night sky's brightest stars. Betelgeuse, the armpit, is a bright red star, while Rigel, the foot, is the sixth brightest star in the sky. The name of Orion comes from Greek mythology, where the hunter was primordial giant who wanted to marry Merope, daughter of the king of Chios, Oenopion. Although there are different versions of the tale, basically Oenopion refused and Orion was angry, and wanted to kill all the animals in the world as revenge. Gaia, the earth goddess, therefore sent a scorpion to poison Orion, terrified that he would carry out his threat. Artemis, the hunting goddess protected Orion by placing him on the opposite side of the sky to the scorpion. This is why the constellation Scorpio rises on the opposite side of the firmament to Orion and the two constellations are never seen in the night sky together.